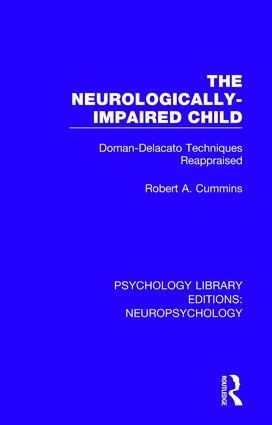 For the 25 years before publication a form of therapy known as the ‘Doman-Delacato Techniques’ had been applied to children with disabilities. The therapy originated from the work of Glen Doman and Carl Delacato who established the Institutes for the Achievement of Human Potential in Philadelphia. The institutes claim to be able to treat a wide range of disabilities, and their best known technique is called ‘Patterning’ and is prescribed for children who have no capacity for voluntary movement. Yet many professional bodies and associations have denounced the approach as overly-expensive, ineffective, creating false hopes, being destructive to family life and based on false theoretical assumptions. Originally published in 1988, this book was the first to offer a detailed analysis and critique of the Doman-Delacato approach. The author draws on data from evolution, neuroanatomy and neurophysiology to challenge its theoretical assumptions. He shows that there is no sound scientific basis to the techniques. Any improvements in a child's condition can be attributed to the increased energy and attention given to that child, rather than the content of the programme. At the same time parents become emotionally ransomed and deluded by false expectations. Written in a style that will be accessible to non-specialists, the book is an important work for both parents and professionals concerned with the welfare of neurologically-impaired children. List of Figures. List of Tables. Acknowledgements. Preface. 1. An Introduction to Magical Thinking, Doman-Delacato and Professional Opinion 2. The Brain as a Functional Unit 3. Laterality and Dominance 4. The Doman-Delacato Brain 5. Doman-Delacato and Language 6. Doman-Delacato Diagnostic Method 7. Doman-Delacato Intervention Techniques 8. The Effectiveness of the Doman-Delacato Procedures 9. In Conclusion. Glossary. Bibliography. Subject Index. Neuropsychology is the study of the relationship between behaviour, emotion, and cognition on the one hand, and brain function on the other. Psychology Library Editions: Neuropsychology (12 Volume set) presents titles, originally published between 1981 and 1993, covering a variety of areas within neuropsychology, a relatively new discipline at the time, as it firmly established itself within the field of　psychology. It includes contributions from well-respected academics, many still active in neuropsychology today.